Chipset makes Qualcomm made quite a few announcements at MWC Shanghai earlier today, which revealed the upcoming availability of new platforms for smartphones, wearables and IoT (Internet of Things). Since we've already reported about the new Qualcomm Snapdragon 450 chip, let's take a look at what the U.S. company has to offer for the wearable market. The new Snapdragon Wear 1200 complements the existing Snapdragon Wear 1100 and Snapdragon Wear 2100 platforms but brings a couple of new features into the mix. First of all, the platform includes an LTE system-on-chip (SoC), power management integrated circuit and wireless transceiver, ultra-low power management operation, as well as a global multimode M1/NB1/E-GPRS modem with support for 15 global RF bands, which have been pre-certified by major carriers across the world. 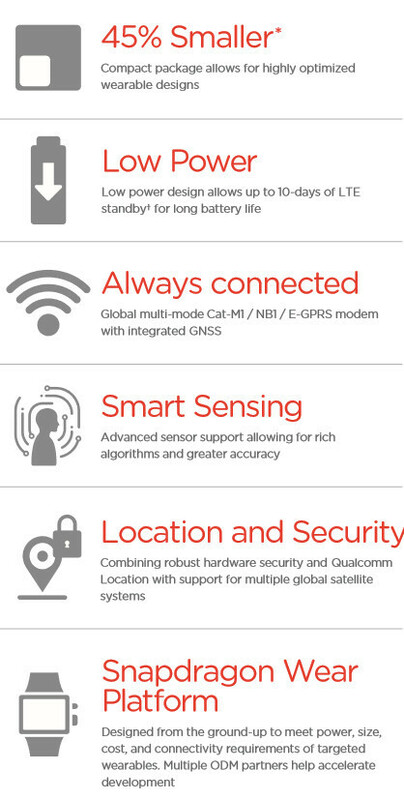 Also, the Snapdragon Wear 1200 benefits from support for GPS, GLONASS, Galileo and BeiDou constellations, low power geofencing, and cloud-based location services. The platform packs an integrated applications processor (up to 1.3GHz) for Linux and ThreadX based apps and is fully scalable to support VoLTE (voice over LTE), Wi-Fi, and Bluetooth. The primary purpose of the Snapdragon Wear 1200 platform is to bring LTE categories M1 (eMTC) and NB1 (NB-IoT) connectivity to the wearables industry. According to Qualcomm, the new chip is commercially available and shipping today. Qualcomm now wants to dominate the Smart Wearable chipset market.. I see.